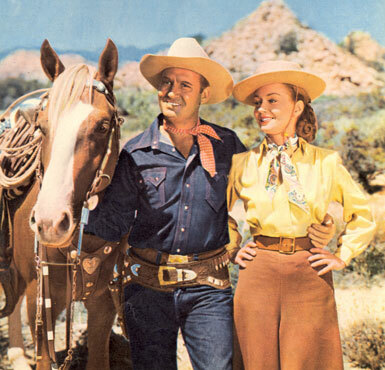 A Western Clippings Salute to Gene Autry on his birthday, September 29. 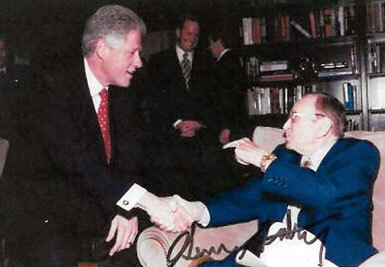 Born in 1907 Gene would have been 110 this year. 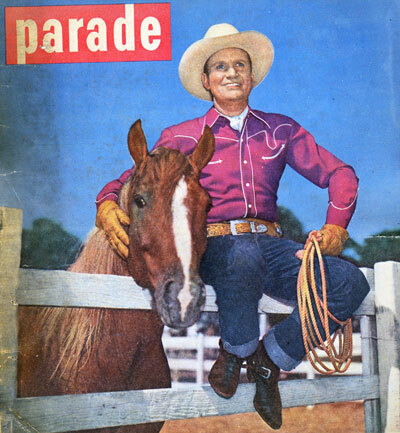 Gene Autry on the cover of PARADE, September 28, 1947. 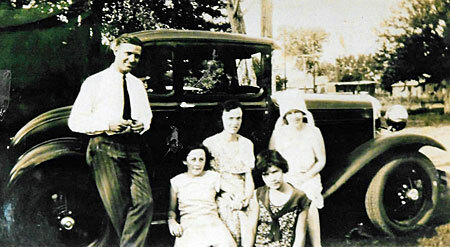 A very young Gene Autry and several ladies in the early ‘30s. 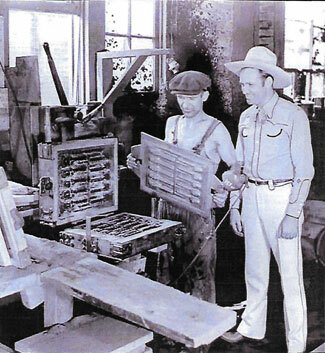 Carl Chamberlin showing Gene his cap pistols in production. 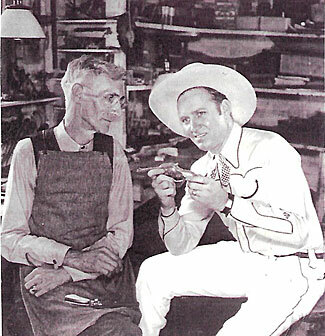 Gene inspects a pistol with master toy maker Joe Solomon who created the mold for the smaller version of Gene’s gun and added Gene’s signature. 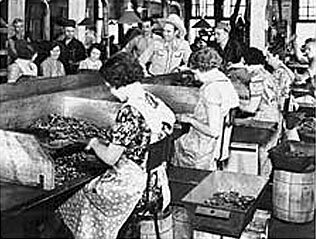 Gene surrounded by Kenton plant workers. 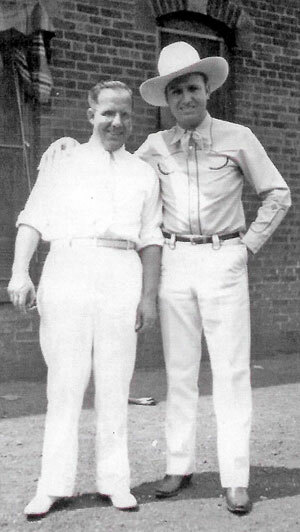 Gene with Kenton plant manager Willard Bixler. 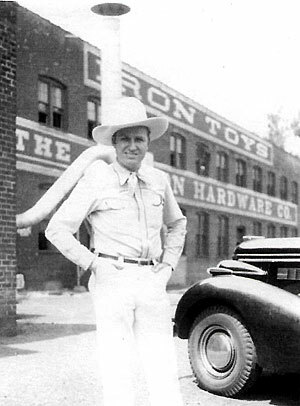 Gene in front of the Kenton Hardware Company. 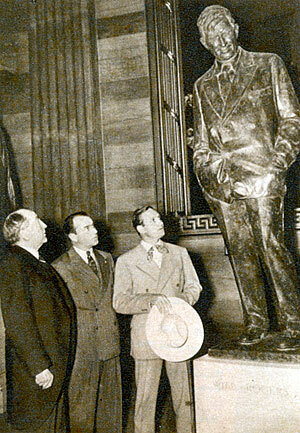 On November 5, 1941, the Carter County, Oklahoma commissioners, at a special session, approved a change in the name of Berwyn, OK, to Gene Autry, OK. Ceremonies were held on November 16, 1941 as Berwyn became Gene Autry, OK. As noted this picture was taken with Gene’s brother and others four years later. 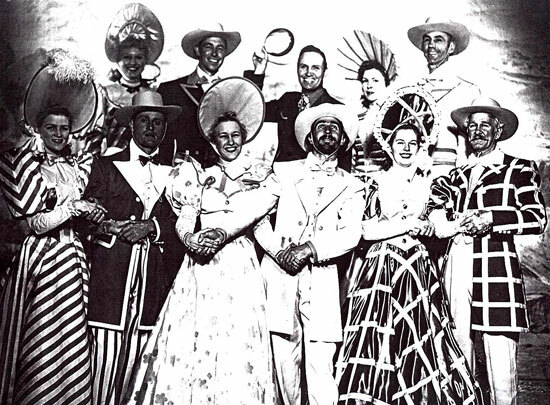 The Gene Autry Radio Show. 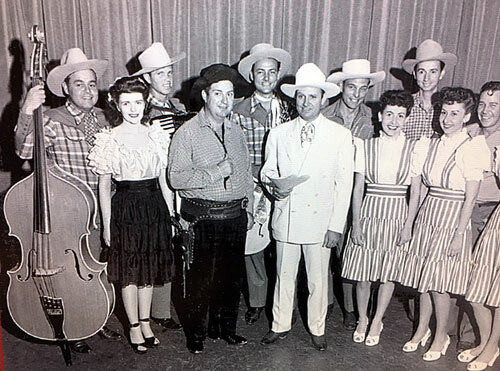 Gene with The Cass County Boys, The Pinafores, Lou Crosby (right of Gene), Johnny Bond (top right) and Carl Cottner (far right). 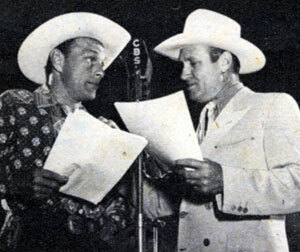 Gene on “Melody Ranch” with announcer Lou Crosby. 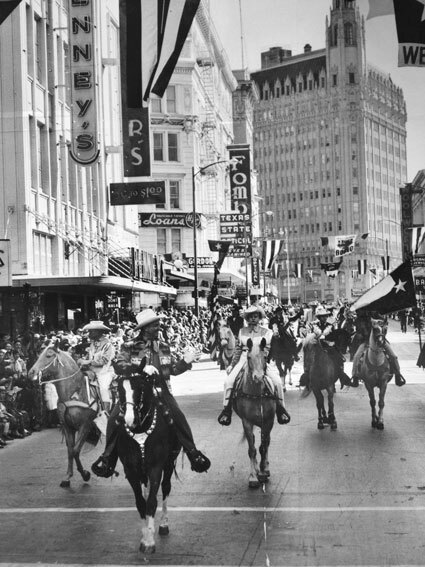 Gene Autry parade in San Antonio, TX. 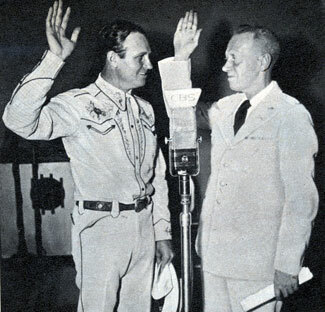 Col. Edward Shaifer administers an oath to Gene inducting him as a Tech Sgt. 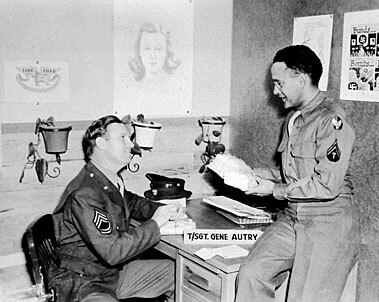 in the Army-Air Force during a “Melody Ranch” radio broadcast. Gene’s in the Army-Air Force as a Tech Sergeant. 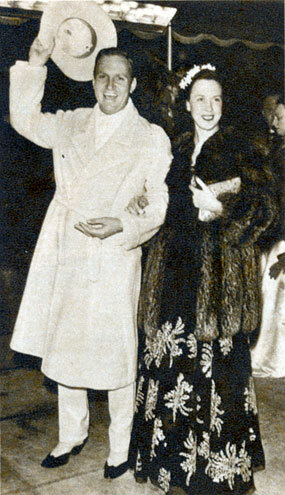 A night out for Gene and his wife Ina. 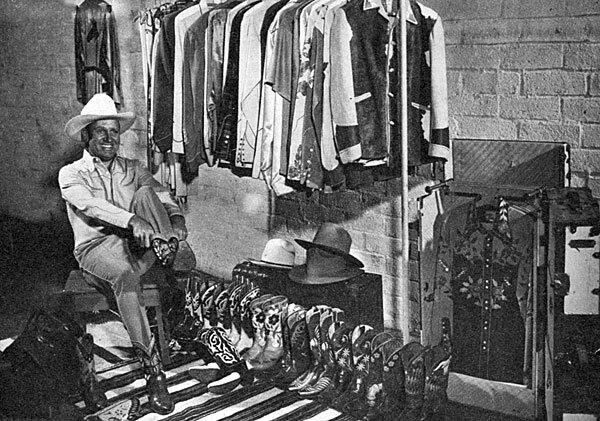 Gene with an array of his shirts, hats, boots and other clothing in 1947. 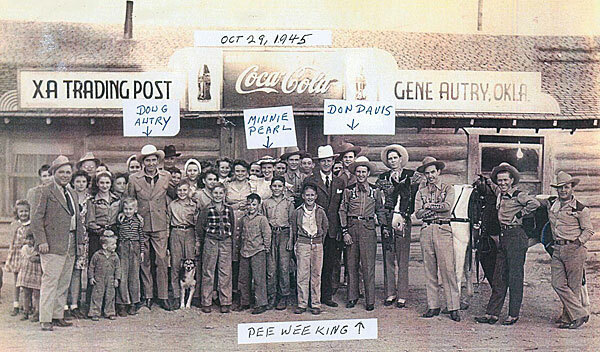 Gene often flew his entire company to film locations and wherever needed. 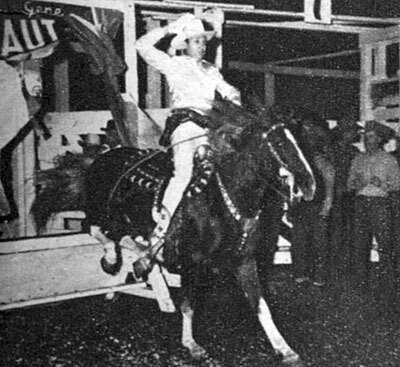 Jumping Champion Jr. through a poster, Gene makes a dramatic entry at a Madison Square Garden rodeo. The quartet that played prominent roles in leading to an amicable agreement over the American League’s entrance into Los Angeles baseball. 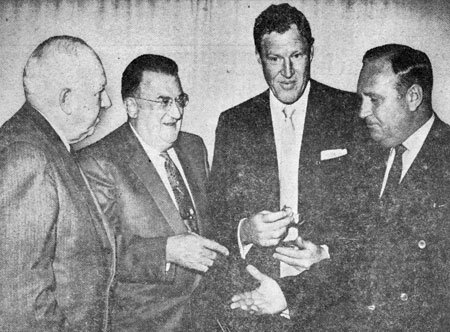 (L-R) Warren Giles, National League President who worked with Dodger President Walter O'Malley in negotiating the arrangement, Autry associate Bob Reynolds and Gene Autry. The big three in the then new Los Angeles American League Club. 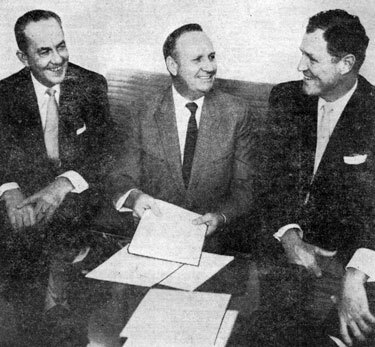 (L-R) Washington attorney Paul O'Bryan who was a stockholder and club director, Gene Autry and former two-time All America from Stanford, Bob Reynolds who was associated with Gene in radio and TV investments. 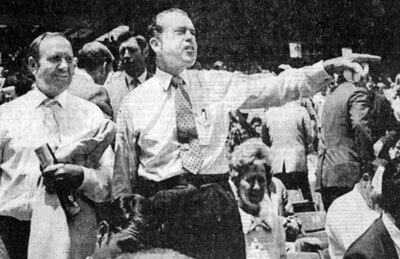 President Richard Nixon in California on July 27, 1970 for 10 days, took in the Washington Senators-California Angels game in Anaheim with Gene Autry. Nixon is yelling some advice to the Senators prior to the game and is holding one of several balls he tossed out. 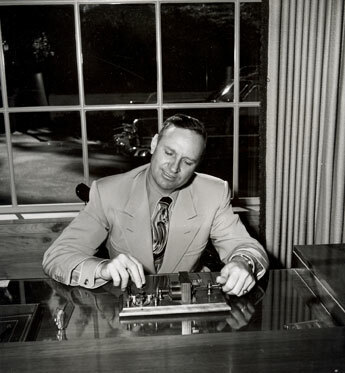 Once a telegrapher in Oklahoma, this 1953 photo shows Gene with a telegrapher’s key on the desk in his den at his home. 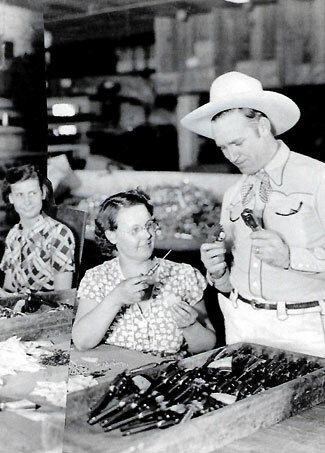 Gene Autry with Champion and leading lady Gloria Henry.